Present - Ron Williams, Don Cull, Dave Cortese, Robert Garner, Ron Crane, Bob Feretich, Ed Thelen. Dave Cortese purchased some indicator lamps, but they were not as bright as the originals, back to the drawing board :-(( Dave would like to find a lamp expert!! 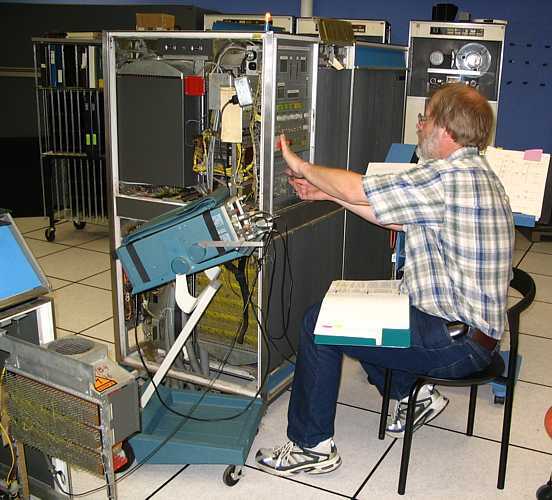 Due to a proposed add-on tape drive simulator device, Ron Crane and Bob looked at the cables in storage, then planned the simulator device. 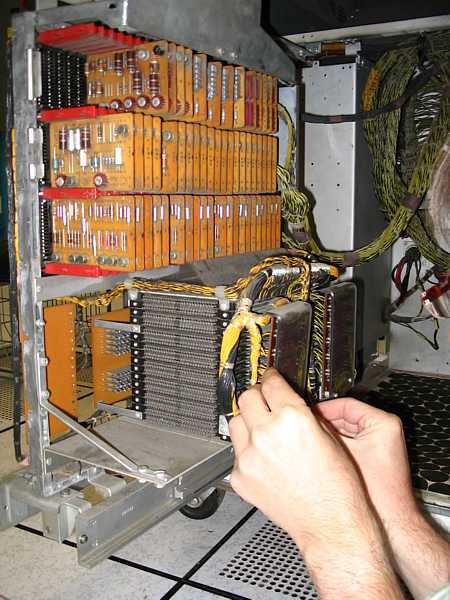 Don Cull worked on the 1402 unit timing contacts (circuitbreakers) on the punch side (the read side are complete :-)). Again, most of the contact are so corroded or dirty or ... that there is no electrical conduction when the breakers are closed. Don removed and cleaned them (sanding with emery cloth and a contact file). The worked better, but one needed MORE sanding! Ron Williams got some more instructions, such as clear memory, going correctly, but even a simple add instruction still gives errors. Present - Ron Williams, Robert Garner, Ron Crane, Bob Feretich, Tim Coslet, Allen Palmer, Ed Thelen. Tim had been kept busy repairing cards. Today, Ron Williams replaced his 40th bad card (above). Jason and Cliff use RPG in their daily work. You could have knocked the rest of us over with a feather!! The language is still alive and well with extensions including terminal screens, sub-windows, and Internet access! Jason is looking for an old 1401 RPG deck for us. - There must be one "out there" somewhere. Robert Garner also cleaned the floor with "Simple Green" soap - the whole room smelled *clean*. 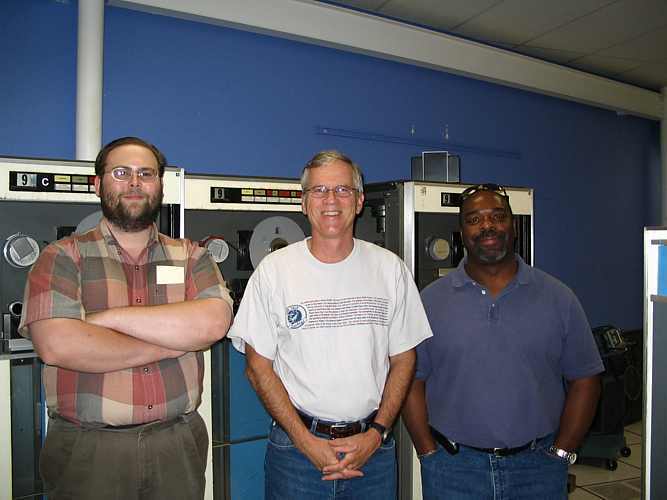 Allen Palmer and Bob Feretich talked of a proposed tape drive emulator. Present were Robert Garner, Grant Saviers ('till knee pained up), Robert Feretich, Ron Crane, Ed Thelen. Robert Garner brought in a 1970s Hp current probe and signal generator that should help Ron Williams chase down some of his troublesome wired ORs. Robert had wired-up a voltage display for the 50 Hz source and investigated how to wire it to the Pacific Power unit. Robert Feretich is a wonder at finding documents in a pile, and found the German FE training notebook and 1401 Diagnostic Book. He studied an English 1401 FE book and the layout of the 1401. Ron Crane finalized the order for a CRT filament transformer for Allen's "IBM" scope and has located sockets suitable for making a doublewide SMS card tester. - Ron Crane got some replacement germaniun transistors from Halted. - Alex Bochannek came by and verified that some German diagnostic documentation was similar to an English version we have. Ron Crane put the new filament transformer into Allen's scope :-)) The scope was put to quick use as most other scopes are not working. Don Cull worked on the 1402 - Robert Garner took the punch side breakers to his work to get them cleaned. Frank King worked on the 1403 printer, introduced Ron Crane to the -60 volt fuse blowing problem. 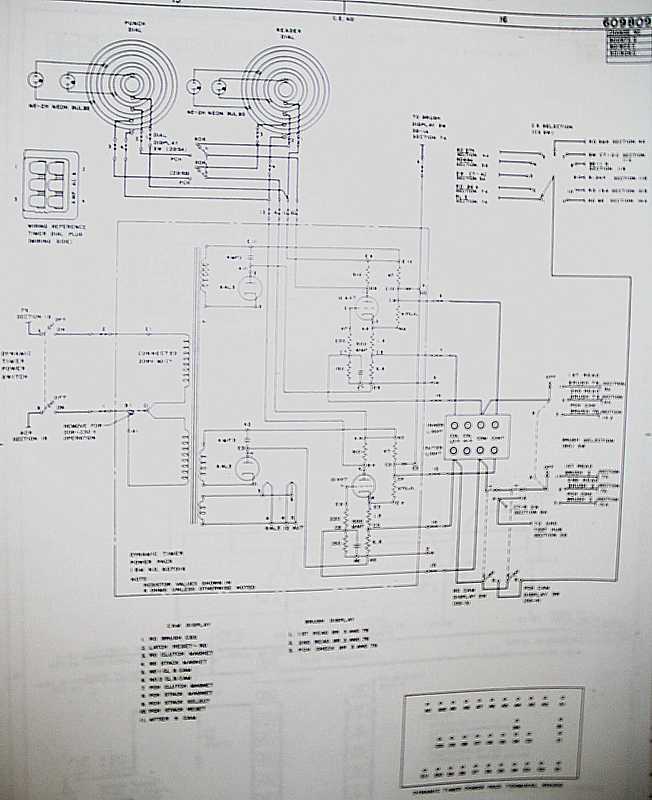 We are looking for the schematics for the 1403 printer controller. 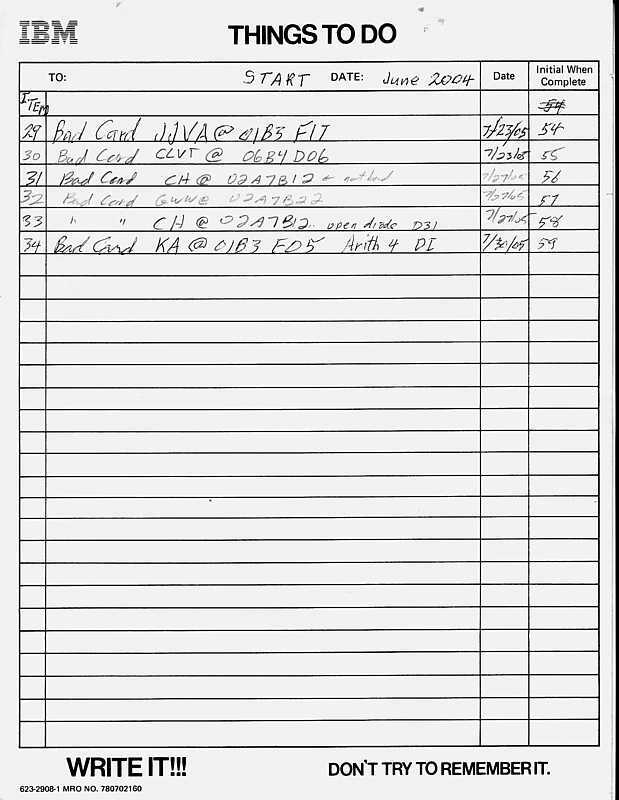 Ed Thelen finished copying the 1401 Diagnostics listings, and took inventory of the note book. Present were Allen Palmer, Ron Crane, Don Cull, Chuck Kantmann, Frank King, LaFarr Stuart, Grant Saviers, Ed Thelen. A major effort to locate the fuse blowing problem involving the 1403 printer hammers and the driver cards (and it was thought printer memory). A diagram 31.??.??.?? was needed and we couldn't find it in the ALDs. I was about to head for the archives when Chuck found it as an A size drawing in a manila folder - what a surprise!! Maybe we need to make a better list of documents and where to find them!! 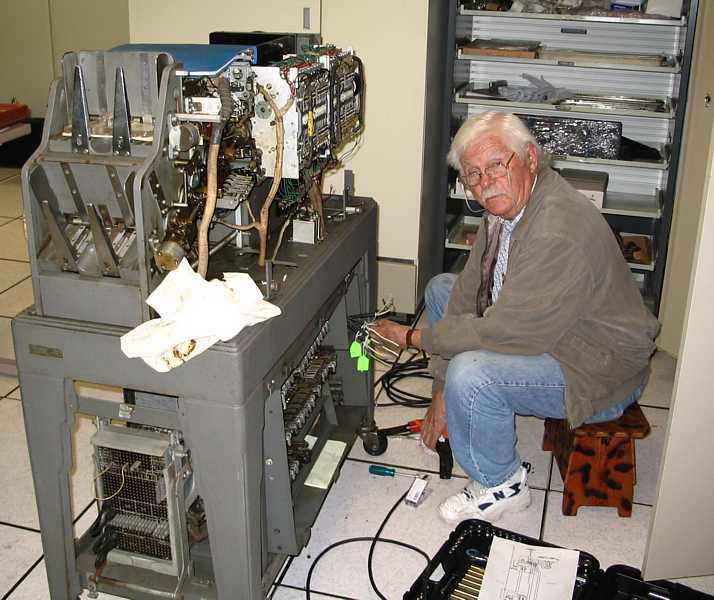 Ron Crane determined that the bias of all the printer driver transistors is way bad - full conduction - and the main 1 amp print fuses blow before the 130 individual hammer driver fuses blow (fortunately!). Some -60 volt bias is not coming back from the printer. Ron Williams (jury duty), Bob Feretich & Ed Thelen will be on vacation. Bob Feretich & Ed Thelen will be on vacation. Report by phone from Ron Williams. Ed Thelen was entaining himself with gout - his body didn't change - and that 2nd bag of potato chips was a killer. Present were Allen Palmer, Frank King, Glenn Lea, Don Cull, Bob Feretich, Chuch Kantmann, Bob Erickson, Robert Garner, Ron Williams. Present were Allen Palmer, Frank King, Glenn Lea, Bill Flora, Bob Feretich, Chuch Kantmann, Bob Erickson, Ron Williams, Ed Thelen. 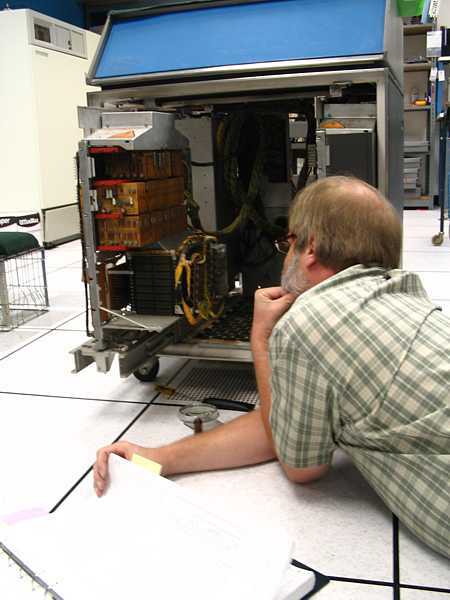 Bob Feretich will be coming in Thursdays to work on the 1401 debugging. The added effort and time should find more bad boards faster. - Allen Palmer and Glenn Lea worked to remove a noisy magnetic drive clutch from the 729 mod V being restored. Removal of the section closest to the reel turned into a real unfinished problem! - Bill Flora and Chuck Kantmann worked on the 1402 timing - the inability to get the dynamic timer circuit to work is getting really annoying. - Bob Feretich found a regulator (drops 30 volts to 12 volts) in the 1406 was overvoltage and unadjustable. Replaced the drive transistor to no effect, replaced the big pass 022 transistor (from John Falk) and solved the problem. - Ron Williams worked on the 1401. 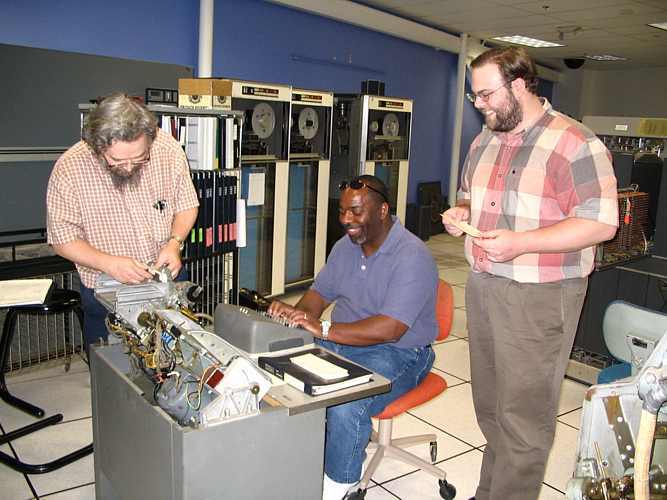 After hours Bob and Ed chased an extended memory addressing problem. Addresses ending in 9 in the 2&3 hundreds range in 8,000 through 11,000 read no bits and bad parity. Report by phone from Ron Williams. Ron Williams and Tim Coslett were there. Ron says "A terrible day, I don't want to talk about it. Things are breaking faster than we are fixing them." The Revolution - At lunch we discussed how to get more done faster - we do not seem to be gaining ground on CPU debug. Problem: on average for the past several months, there seems to be one bad card found per session, and it seems that one more card fails per session. Not good!! - Test all cards of one type per gate at a time - Ron Crane to determine how to test? 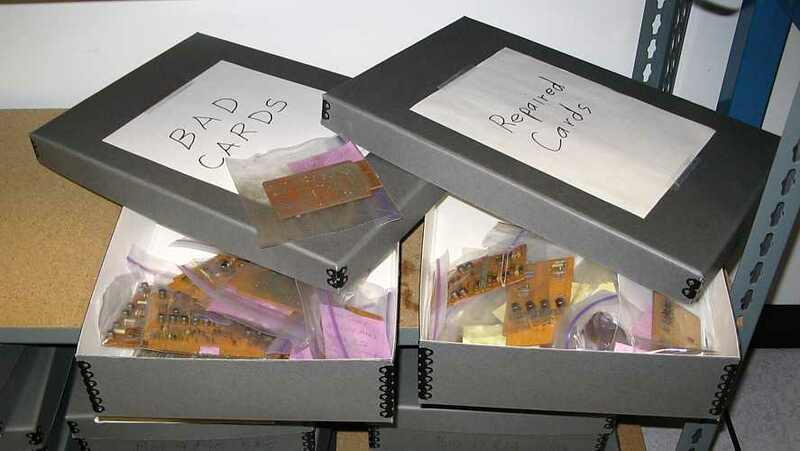 - Replace passed cards back into the same slot. - mark? record? 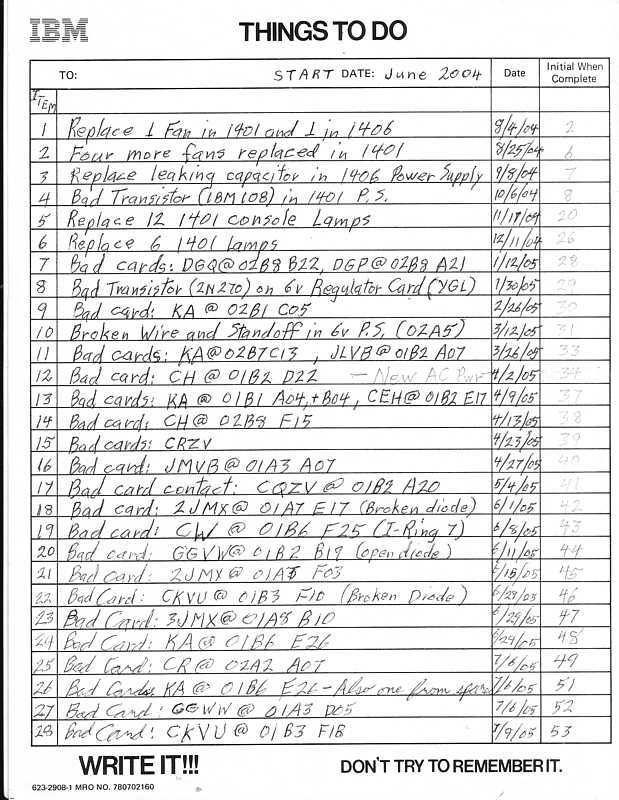 repair history of cards, if so need serial #s? - Have more than one testing/debugging session per week - Ron Crane started to analyze the "Unit Plugging Charts"
Allen, Chuck and Glen finally got part of the 729 magnetic clutch off the shaft. There was much force used and the Woodruff key needs replacement. 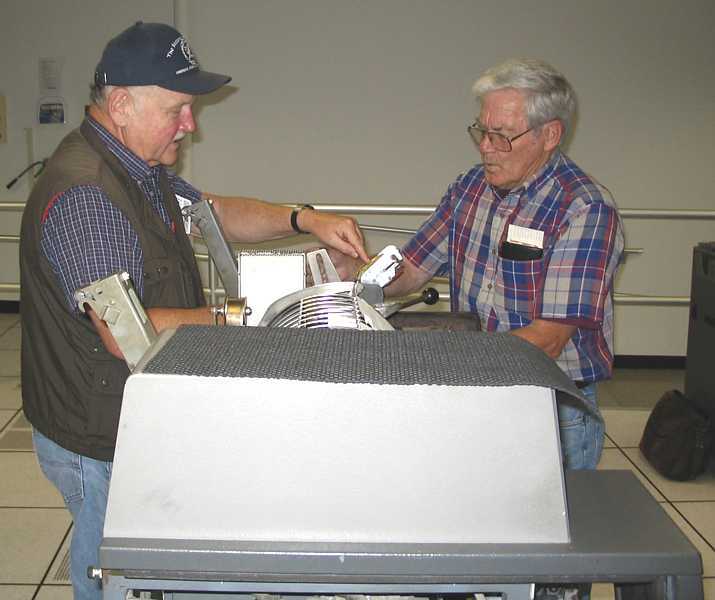 After most folks left, Bill Flora removed 1402 timing amplifier which already had new tested tube, Ron Crane examined the operation of the circuit and determined that the amplifier was OK and driving both neon lamps with enough current. Ed determined that the timing light was indeed bright, but you still could not see it adequately through the timing slit. The light was somehow not positioned correctly in the little holder. Now fixed. Whew!! Then Ron and Ed measured and scoped the input and output power of the Pacific Power frequency converter. About 10 KW and 4.5 KW respectively. Ron said that 10 Kw heat from frequency converter and 1401 processor require about a 3 ton air conditioner to remove - maybe add another ton for lighting, people, and other things - the brutally noisy air conditioners in the room already got us to thinking about replacement? they didn't see the exact break. - a bad core driver transistor (open collector) - Ron replaced it. Present were Chuch Kantmann, Bill Flora, Milt Thomas, Robert Feretich, Grant Saviers, Ron Williams, Frank King, Ron Crane, Bob Erickson, Ed Thelen :-)). I list people and show pictures so that wives will not suspect the worst. The 1402 reader timing light did not get completely fixed :-((( Both lamps glow just fine statically, but one fades in a few seconds when the disk is spun. Bill Flora and crew checked the disk slip rings, brushes, springs, ... and gave up to do other things. Other things include the 1401 Read Card command causes a 1402 to pass a card - whether data got transfered was not checked yet. Ron W reports that one read card command causes the card reader to start and not stop feeding cards, some read completion signal is missing? The 1401 can successfully command the printer to skip and space - I suppose you want it to print too? ?? 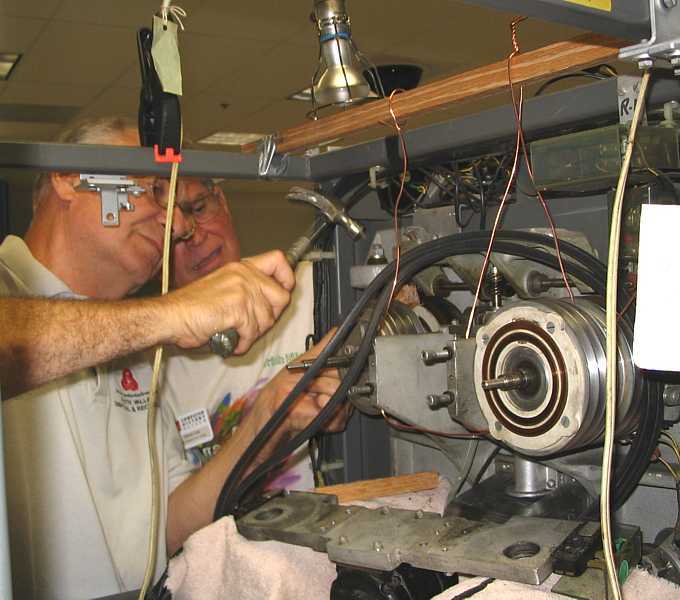 The old power wiring in the 077 collator is pretty much crumbling - Bob Erickson is replacing it. bad picture :-(( The 1401 processor guys get all the glory (and pressure) - and no picture this time. After hours, Ron Crane played with power - see below - till 9:15 P.M.
Bob Feretich and I got all the counters working in the TAU [Tape Adaptor Unit] ... . 3 bad TAU modules total Wed & Thurs. We are finding many ALD errors (or we haven't figured out how IBM names the card gates (swing out frames), although finding a single flip flop module split onto two gates in the prints does not appear to be our error :-( ). 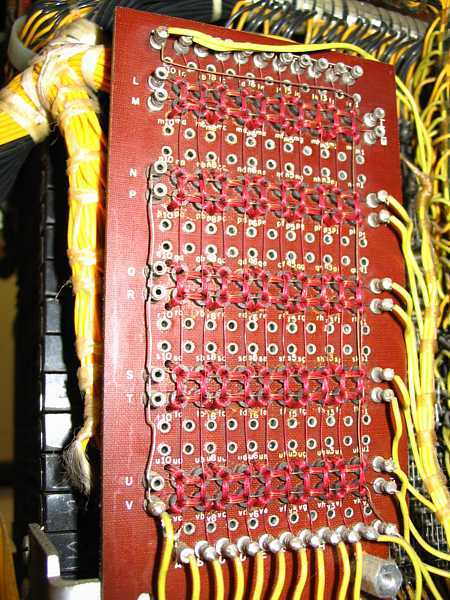 We are also missing some module schematics, 2 or 3 I think out of the 10 or so we looked for. Are there other documents sources to explore to remedye these problems? Present were Milt Thomas, Frank King, Bill Flora, Bob Feretich, Ed Thelen, Bob Erickson, Ron Williams, Grant Saviers, Chuck Kantmann, Ron Crane, Don Cull. Frankly, I arrived late, and got caught up in Ron Crane's study of the environment of the 1401 room. Apparently someone has turned off the re-heat part of the humidity control, which will reduce the expense of cooling the museum's UPS system to maybe $23,000 a year. :-)) By the time we got back from visiting with museum people, the rest of the workers had gone home and I don't know of progress. Attendee list from Robert Garner - Bob F, Ron W, Bill F, Grant, Frank, Chuck, Ron C, Ed T., Robert G.
Ron Williams presents this brief history of the physical restoration activities. Paul Pierce of Portland, OR very kindly sent one of his 729 tape cables so that Ron Feretich, Ron Crane, and Grant Saviers can make a 729 tape simulator to help test the TAU (Tape Adaptor Unit) in the 1401 computer box. 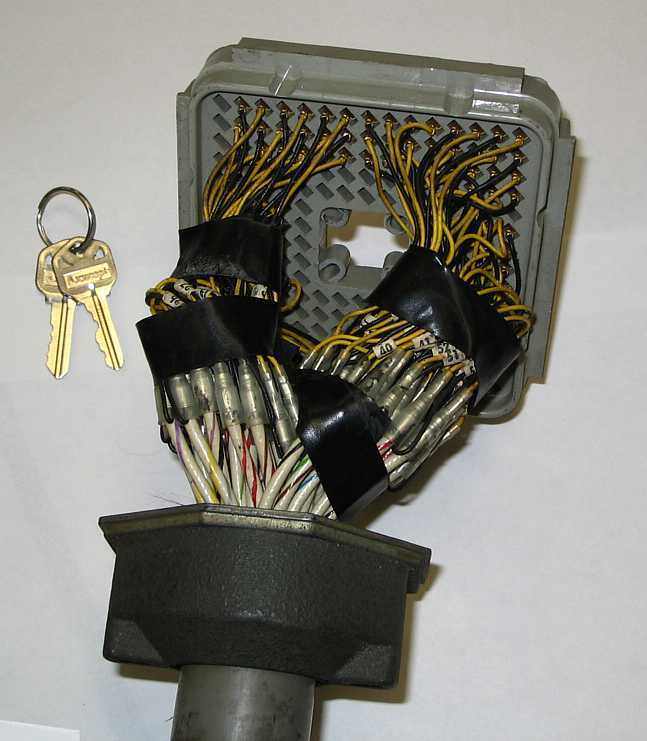 This image shows the cable end minus the exterior metal housing. What you are looking at weighs more than a current lap top.